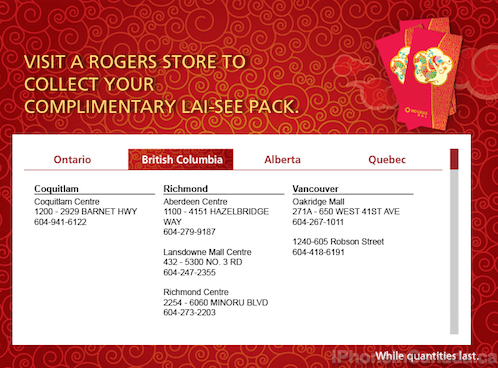 Rogers is offering a long distance promo for those that celebrate Chinese New Year, (also known as the Lunar New Year). During this time, lots of people call overseas to Asia to wish friends and families a prosperous and lucky new year. 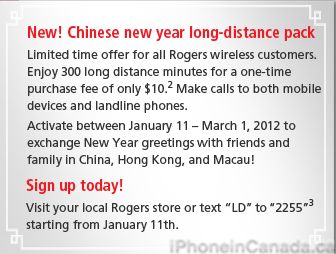 To capitalize on this celebrate, Rogers has offered up a long distance promo for calls made to landlines and mobile numbers in China, Hong Kong, and Macau. The cost will be a one time $10 charge for 300 minutes, and airtime is not included. The deal started yesterday and ends March 1, 2012. Limited time offer is available starting January 11, 2012 – March 1, 2012. This includes 300 long distance minutes to the applicable countries for a one-time charge of $10. Airtime not included. Airtime charges apply to both landline and mobile terminating calls. Minutes included in the Long Distance add-on apply for 1 month from the date of purchase. Long Distance charges apply to customers who exceed the minutes included in the Long Distance add-on . Long distance charges are rounded up to the next full minute. Mobile Terminating calls are billed by the second (30-second minimum).Long distance add-on applies to calls originating in Canada on the Rogers wireless network and terminating outside of Canada in the applicable countries. Calls originating in Canada and terminating outside the applicable countries associated with the particular add-on charged at standard rates. Rates may differ for landline versus mobile terminated calls. How to jump on this deal? Visit any Rogers store, or text “LD” to “2255” from your cellphone. Other countries such as South Korea and Vietnam also follow the same lunisolar calendar and celebrate the new year equally–maybe they will be included too in the future? Anyone going to jump on this?